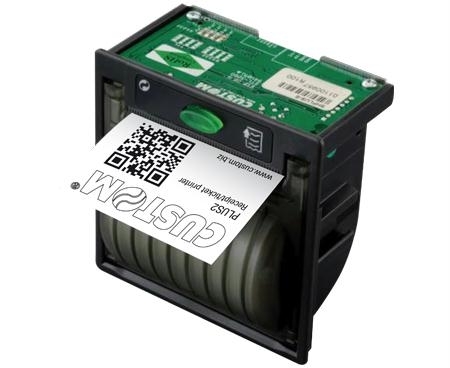 The PLUS2 is Custom's standard 2 inch thermal panel printer. It's small enough for most mobile printing applications but large enough to take a 50mm diameter (almost 30m) paper roll. It is powered from 5VDC making it suitable for battery power. A plugin module is available to power the printer from 9 to 48VDC to aid integation into a wide range of panels. The built in triple interface communicates via USB, RS232C or serial TTL protocols. The Custom range of panel printers can be operated at an industry leading temperature range of -20 to +70°C. This makes them ideal for demanding industrial and field use in extreme environments. The PLUS2 panel mount printer is fully compatible with MaxStick, a new repositionable, liner-free, thermal label by Max International. Industrial automation and instrumentation, control process, automotive diagnostics, sterilization equipment, autoclaves, incubators, medical measurement and analysis, etc..